Cause of death: senile gangrene, commonly known today as arteriosclerosis, or the thickening and loss of elasticity in the arteries. 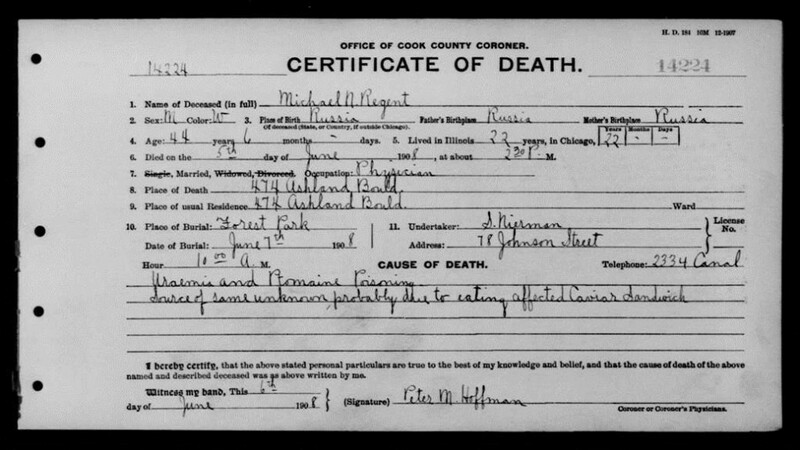 No document is more pivotal to genealogical work than a death certificate. The reason for its importance goes far beyond simply providing researchers with a date of death for an individual. Perhaps just as critical to understanding family history as the date of death is the cause of death. Records of deaths were originally kept by churches in the colonial period, but eventually these records led to the development of legal documents which served a similar purpose. The Massachusetts Bay Colony made courts responsible for death records in 1639, going against the traditional European model of having churches record deaths as well as baptisms and marriages. 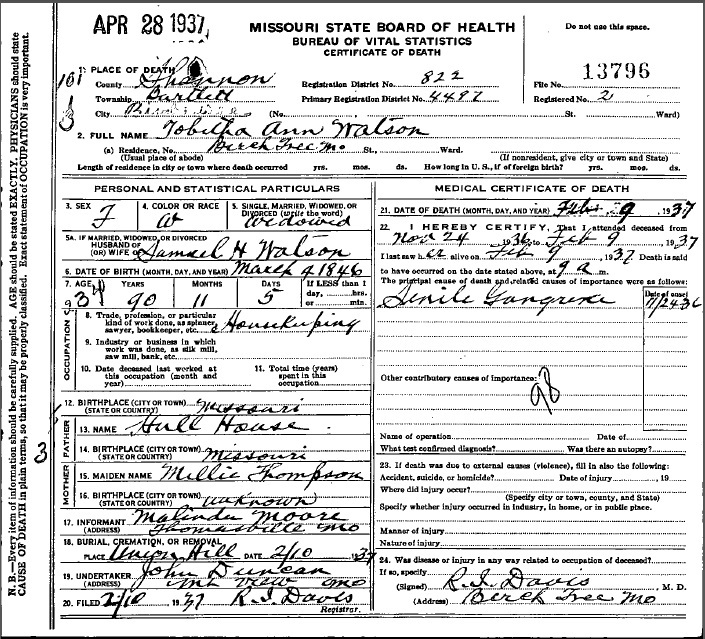 Despite this, no universally accepted death certificate model was put into place throughout America until 1910. Because of this, doctors and other officials lacked widely-accepted terminology for various causes of death and, as a result, many antiquated and long-abandoned terms for illnesses were printed on these documents well into the twentieth century. Knowing the meaning and origins of these outmoded terms can provide researchers with a cause of death for an individual, in turn revealing a great deal about both the life and death of the deceased. For instance, knowing that Bronze John is an archaic term for yellow fever or that ‘Bladder in Throat’ referred to diphtheria allows researchers to infer that the individual in question likely suffered a long-drawn-out death affecting other family members physically, emotionally, and financially. Furthermore, knowing that a death was likely expected at the time, one can surmise that the deceased composed a last will and testament or made the appropriate amendments to an existing will. Conversely, other long-discarded terms such as Dry Bellyache, meaning lead poisoning, or ‘Softening of the brain’, a result of stroke or hemorrhage of the brain, indicate an unexpected and quick death, which likely would have a long-lasting effect on the deceased’s family, forcing children to work to make up for lost wages or a relocation to find employment. Additionally, financial hardship as a result of an unexpected death might require the spouse of the deceased individual to move in with other family members, in turn necessitating household shifts, whether in the same town or across several states. The cause of death can tell researchers about how a person lived – as well as how they died. Michael N. Regent of Chicago died in 1908 after consuming a tainted caviar sandwich. Causes of death also tend to reveal quite a bit about historical changes over time. According to data provided by the Center for Disease Control, ailments which were among the top causes of death in America in 1900, such as influenza and tuberculosis, were not among the top ten in 2010. While these illnesses are no longer considered a major threat, they were a very real concern for men and women across the world a century ago. An ailment such as pneumonia may look out of place as a cause of death to modern readers, but only three generations ago it was the most commonly listed cause of death on death certificates. Knowing and understanding the cause of death of an ancestor can also help genealogists with another critical tool: gravestones. Gravestones often provide, at the very least, a year of birth and a year of death, as well as a burial place for an individual. Knowledge of an individual’s cause of death may significantly affect the search for a gravestone. I am a descendant of Captain John Luther, one of the founders of the town of Swanzey (now known as Swansea), Massachusetts. He was killed by Native Americans during a trading expedition in the Delaware Bay, and because of the nature of his death, Luther was ultimately buried at sea and so had no gravestone in Swansea, eliminating the possibility of finding this resource to advance my research. Knowing the cause of an ancestor’s death can completely change the way that genealogists approach a research problem, and for this reason, this information is critical to uncovering family history. 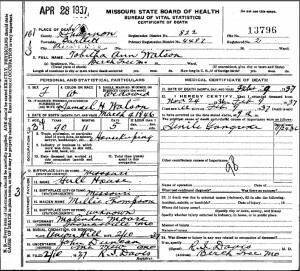 US GenNet, “Old Disease Names Frequently found on Death Certificates” http://www.usgennet.org/usa/ar/county/greene/olddiseases1.htm. Gwen Sharp, PhD, “Historical Changes In Causes Of Death” Sociological Images, 25 June 2012, http://thesocietypages.org/socimages/files/2012/06/causeofdeath.png. It also helps to pay close attention to critical data about the deceased that is supplied by someone in the family. A spouse MAY have the correct information as to parents, birthplace etc, but when the info is given by an in-law or a close friend, “researcher beware “. It can be very confusing where relatives place a gravestone in a family cemetery in cases such as the above. You might not have had a reason to question his place of death, and might not have discovered the manner of death. How do I find death certificates in areas that were part of the frontier? My folks kept moving until they hit the west coast in the 1850’s. You might get lucky and find the date and location of burial for an ancestor on findagrave.com, or on a county or town historical society website that has a searchable online death list. Good luck. Old newspapers are another source for date and cause of death. My great-grandfather died in pre-statehood Oklahoma which did not require records maintained until 1910. I found his date of death and cause of death in the Oneida NY newspaper where he was born and raised, and lived with his family until they moved to Oklahoma Territory in 1905. His body was returned to Oneida for burial. All of this information was in the newspaper account of his death. My ancestor’s mother’s maiden name was either Morgan or Hussey, depending on his mood of the day! His death certificate says Morgan, his sister’s death certificate says Hussey. I am on the hunt for baptismal records for him and his siblings to see if I can get to the truth! Also, in more modern times, I have seen death certificates with incorrect gender information, as well as incorrect social security numbers (in my former life as a trusts and estates paralegal). Yet more reasons to double and triple check information on “official” records! Hello, cousin! Captain John Luther is my 10th great-grandfather. The most curious cause of death I’ve found in my research is “paralysis of the heart” on a late 19th century certificate in Washington County, IA. Also, one does have to be careful about data supplied by family members, as another poster observed. My 2nd great-grandmother Adeline Mann’s death certificate gave her mother’s maiden name as Adeline Tripp, which was what had been passed down also through family lore. Not so, her name was Hannah Tripp, and once I accepted that (the evidence was overwhelming) researching her husband’s ancestors landed me on the deck of the Mayflower! I don’t understand why, because he was killed by natives on a trading mission, he would ultimately be buried at sea. What about that manner of death would preclude his being buried in the ground? Excellent question! Perhaps the wording was incorrect there. What I was intending to say is that records have shown that he was ultimately buried at sea, which occurred as a result of his death quite a distance from his home. Having died in Delaware Bay, its unlikely (although, still possible) that his body would have been transported back to Massachusetts given that the trip would take a fair amount of time. Regardless, records have stated that he is believed to have been buried at sea. I had not intended for it to seem as though one implied the other. An ancestor who died in IL in 1884, had a cause of death listed on the death certificate as “acute bronchitis which he had for three weeks. A complication of the bronchitis was inflammation of the bowels which he had for four days,” according to the doctor who signed the death certificate. He’d apparently been healthy, as he was an interim minister, aged 75. Another descendant has spent a lot of time with the lists of odd 19th c. names for causes of death knew that this combination meant that our ancestor had inflammatory bowel disease (IBD), which wasn’t well known at the time. From what we know of his health history, this makes sense, as he had many years of good health, interspersed with periods of “the bloody flux,” a name for one of the symptoms of IBD. Since this doctor had only treated him for three weeks, he was pretty good for a country doctor!